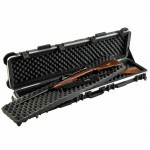 Blackhawk Sportster Modular Weapons Case - Black. 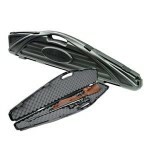 Constructed of 600 denier polyester with thick PVC laminate and dual-density foam padding. Modular discreet case with removable divider Internal S.T.R.I.K.E. webbing for attaching pouches or accessories Includes muzzle retainer and weapon retainer ..
* Largest economy single available * Four locking points and piano style hinge keep children out when properly locked * Durable egg-shell foam * Patent #D498 052 & #6 874 628 * Size: 4.5" x 53.5" x 13.5" ..
MTM Double Handgun Case - Black. Constructed of rugged polypropylene to be durable and scratch resistant. Large, comfortable handle, reliable latches and can be padlocked. Fits two semi-automatics or revolvers with up to 8" barrels. Exterior Dimensions: 15.5" x 12.2" x 3.6"H Interior Dimensions: 14.7" x 10.6" x 3.3"H ..
Strong polyurethane wheels with stainless steel bearings Watertight, crushproof, and dustproof 3-piece foam set Automatic Pressure Equalization Valve - balances interior pressure, keeps water out Easy open Double Throw latches Fold down handles O-ring seal Open cell core with solid wall design - strong, light weight Stainless steel hardware and padlock protectors Interior: 42" x 13.50" x 5.25" Exterior: 44.37" x 16" x 6.12" ..
* Watertight crushproof and dust proof * Easy open Double Throw latches * Open cell core with solid wall design - strong light weight * O-ring seal * Automatic Pressure Equalization Valve * Fold down handles * Strong polyurethane wheels with stainless steel bearings * Stainless steel hardware and padlock protectors * 3-piece foam set * Lifetime Guarantee of Excellence * Exterior Dimensions - 53.00" x 16.00" x 6.12" * Interior Dimensions - 50.50" x 13.50" x 5.25" * Empty weight 25.57 ..
Removable camo wrap for your case. 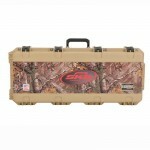 (Case not included) Fits model SKB 3i-4217 ..
Removable camo wrap for your case. 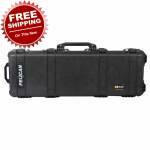 (Case not included) Fits model SKB 3i-5014 .. Multiple latches ensure maximum security and durability. Unconditionally Guaranteed for Life. Dimensions: Exterior 14.2 x 11.4 x 6.5 in. Interior 13 x 9.2 x 6 in. 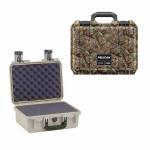 Weight: 4.8 lbs (empty weight) Color: Tan with Realtree Lid FEATURES: Vortex Valve Flush Powerful Hinges Lightweight Strong HPX Resin Watertight Guaranteed For Life ..
Bulldog Camo Panel Scoped Rifle Case - Black with APHD Camo. It Floats! High Definition 3D Camo panel insert between handles 2-1/4" total soft padding #10 Full-length zipper with pull Zippered accessory pocket Durable, heavy-duty Nylon, water-resistant outer shell Brushed Tricot, soft scratch-resistant inner lining Case shape accomodates scoped and non-scoped rifles .. The world's most recognized transport case company now offers TSA accepted padlocks to provide convenient and secure airport cargo inspection. 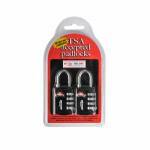 SKB's TSA accepted padlocks allow you to set your own combination and are easily recognizable by TSA screeners. The Transportation Security Administration (TSA) baggage screeners are trained to recognize the Travel Sentry logo on TSA accepted locks, which allow them to open, inspect and relock baggage. .. 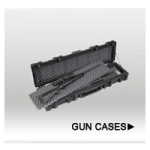 The Double Rifle Transport Case 5009 is made to ATA 300 Category 1 specifications, ensuring the products ability to withstand 100 trips by air,the highest shipping container specification of the ATA. 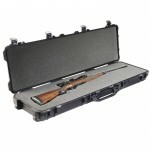 Capable of accommodating two rifles with SKB's trademarked "bunk bed" storage system with foam dividers that provide a separate compartment to protect two rifles. 50" x 9.50" x 6" Capable of accommodating two rifles with SKB's trademarked "bunk bed" storage system. Airline approved (ATA 3.. 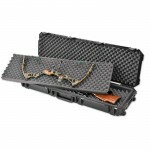 The 3i-5014 Double Bow Case features a bunk-bed storage system with rigid foam dividers for storing/transporting two bows or a rifle and a bow. Bunk-bed storage system with rigid foam dividers. In-line skate style wheels for easy transport. Trigger release latches can be retrofitted with TSA accepted key locking latches. Padlock holes include stainless steel padlock protector clips. Cushion grip handles on three sides for comfortable lifting and carrying. Waterproof and dust tigh..